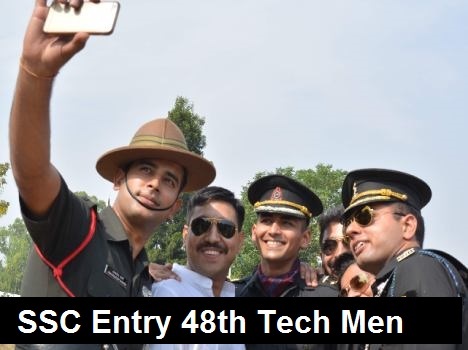 Hello Aspirants, looking for SSC Entry 48 Tech Men Indian army recruitment we have a good news for you as Indian army soon will be announcing Applications for married/unmarried MALE Engineering Graduates for 48th Short Service Commission (Technical) Course (commencing in Oct 2016 at Officers Training Academy (OTA), Chennai) for commission in the Indian Army in all Arms/Services. Interested and Eligible candidates can apply online by reading article from the official website of Indian army on or before 8th January 2016. Feel free to ask below in comments regarding SSC Tech Men Entry. Age Limit : – Candidates applying for 48th Short Service Commission (Technical) Course (SSC (T)) must be born between age of 20 to 27 years i.e, candidates born between 02 Oct 89 and 01 Oct 96, both dates inclusive. NOTE : The date of birth accepted by the office is that entered in the Matriculation or an equivalent examination certificate. No other document relating to age will be accepted and no subsequent request for its change will be considered or granted. Educational Qualification: Candidates should have passed the requisite Engineering Degree or be in the final year of Engineering Degree course. The candidates in the final year of Degree Course should complete all their examinations related to the degree, like, written, practicals, viva, projects, backlogs, etc prior to 01 Oct 2016 for SSC (T) 47. They should be able to produce the Engineering Degree within 12 weeks from the date of commencement of training at IMA/OTA. Such candidates will be inducted on Additional Bond Basis for recovery of the cost of training at IMA/OTA as notified from time to time as well as stipend and pay & allowances paid, in case they fail to produce the requisite Degree Certificate. The candidates will be given a stipend of Rs. 21,000/- p.m. (Rs 15,600/- as pay in Pay Band plus Grade Pay of Rs. 5,400/-). On completion of training they will be commissioned in the rank of Lieutenant and entitled to pay as admissible to the rank. Army also provides free Medical Facilities for self & dependents, Canteen facilities, Entitled Ration, Mess/Club/Sports Facilities, Furnished Govt. Accommodation, Car/Housing Loan at subsidised rate. For details of pay and allowances and facilities visit official Indian army website www.joinindianarmy.nic.in. 1. Eligible and Interested candidates have to apply through online Applications will only be accepted online on website “www.joinindianarmy.nic.in”. 2. After that click on Officer Menu then go to How to Apply and then click ONLINE APPLICATION. 3. Fill the online registration form. Note down the user id and password. Tips to assist in filling up fields have been provided as you click on ONLINE APPLICATION. 4. Candidates before submitting the application check the entries you have entered and save the application. 5. After submitting, take two copies of the printout and the Roll Number generated by the system. One copy of the Print out of application duly signed and affix with photograph attested by Govt Gazetted Officer. Attested copy of Matriculation or equivalent certificate for age proof. Attested copy of 12th Class Certificate & Marksheet. Attested copy of Engineering Degree/ Provisional Degree Attested copy of Mark Sheets of all Semesters Certificate form the Principal/Head of the Institution stating that the candidate is in the final year and final exams will be over by 01 Oct 2016 for final year appearing candidates of SSC(T) Entry. Equivalence certificate of the concerned university to claim equivalence. (Refer Note 2 to Para 4 of this notification). All certificates in original. Originals will be returned after verification at the Service Selection Board itself. Any candidate who does not carry these entire documents for the SSB interview, his candidature will be cancelled. The second copy of the printout of online application is to be retained by the candidate for his reference. No need to send any hard copy to DG Recruiting. Candidates must submit only one application. NOTE: Receipt of multiple applications from the same candidate will result in cancellation of candidature. 1. Short listing of Applications. Integrated HQ of MoD(Army) reserves the right to shortlist applications and to fix cutoff percentage of marks for each engineering stream/discipline without assigning any reason. 2. Only shortlisted eligible candidates depending on the cutoff percentage will be interviewed at Selection Centres, Allahabad (UP), Bhopal (MP) and Bangalore (Karnataka) by Psychologist, Group Testing Officer and Interviewing Officer. Call Up letter for SSB interview will be issued by respective Selection Centres through candidate’s registered e-mail id and through SMS. Candidates will not be interviewed locally. Allotment of Selection Centre is at the discretion of DG Rtg, IHQ MoD (Army) and no request for changes are entertained in this regard. Interviews will be held in April/May 2016 for both the entries together. 3. Candidates will put through two-stage selection procedure. Those who clear Stage I will go to Stage II. Those who fail in Stage I will be returned on the same day. Duration of SSB interviews is five days excluding day of arrival and details of the same are available at official website of Rtg Dte www.joinindianarmy.nic.in. This will be followed by a medical examination for the candidates who get recommended after Stage II. Provisions of preparation of all India merit list and allotment of entry is according the vacancies in Indian army. It is to be noted that mere qualifying at the SSB interview does not confirm final selection. Higher educational qualifications, previous performances, NCC background, etc, have no role to play in the merit list. Percentage cut off for ssc tech 48? % Cut off of I.T branch ???? % cut off for civil?